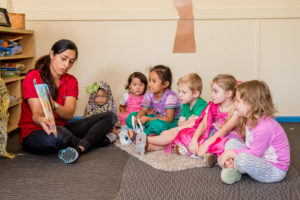 Our 4 year old kindergarten program is run by a degree qualified Kindergarten Teacher, who plans and implements activities that focus on School Readiness in a play-based learning environment. Our kindergarten program encompasses a variety of learning programs to build on your child’s social, emotional, cognitive and physical skills and development. For a full list of our learning programs, click here. Our 4 year old kindergarten program is offered 5 days a week. This will give your child greater exposure to high quality learning experiences and a School Readiness program, with the added benefit of the flexible long hours of an education and care setting and at no extra cost to you. 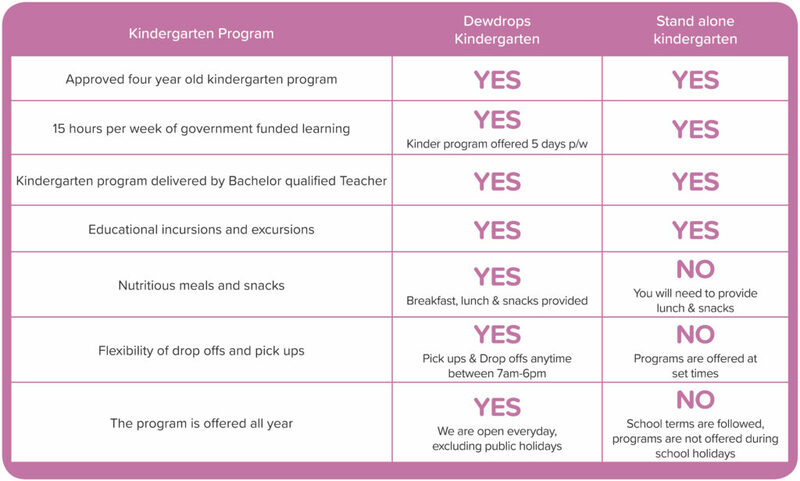 What is the difference between Dewdrops Kindergarten and a sessional kindergarten? 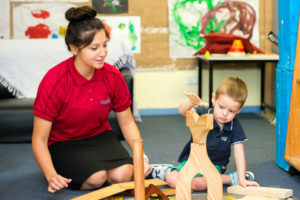 Kindergarten is offered to children in two ways, either integrated into an early learning and child care setting or as a stand-alone sessional service. While each model offers funded and accredited programs, how they are delivered and the number of hours per week that you can access the program, will differ. The chart below explores the similarities and differences between the two models and will help you determine which model will work for your child and your family. Social emotional development: Self-awareness and regulation; social emotional understanding; empathy and caring; initiative in learning. Language and Literacy/English language development: Language use; vocabulary and grammar; concepts about print; phonological awareness; word and letter recognition; comprehension and analysis of age appropriate text; literacy interest and response; writing. Categories of English language development include listening, speaking; reading and writing. Science: Science fosters a joy in discovery and a positive approach to learning. Children become confident learners by hypothesising, identifying solutions and problem solving. Through persistent hands on experimentation children become critical thinkers, a skill that remains with them for a lifetime. The skills in kindergarten consist of language of science/scientific inquiry; knowledge of physical sciences, life sciences and earth sciences. Mathematics: Children explore mathematics by interacting with their everyday environment. Throughout their daily routine there is counting, sorting, shapes, building, measuring and estimating; number sense; algebra and functions (classification and patterning); measurement; geometry and mathematical reasoning. Visual and Performing arts: This comes naturally to children as they begin with scribbles, then drawing, pretending, humming, and swaying to music. All these activities lay the foundation and help prepare children for successful learning.